After recently upgrading to WordPress 4.0, one of my client’s blogs who was using Thesis 1.8.4 stopped seeing the actual comments. She saw the comment count, but was unable to see the actual comments themselves. She was able to see them in the backend, but was unable to see them in the front-end. After doing some research, it turns out there is a fix for it, found here. The fix was pretty simple, and although this article mentions that you must upgrade to Thesis 1.8.5+, this coments problem worked for me for Thesis 1.8.4. 2. Unzip the file to your local website folders. 3. Using FTP, navigate to the /wp-content/themes/thesis_185/lib/classes/ folder on your server. (it would be the thesis_184) folder for Thesis version 1.8.4. 3. 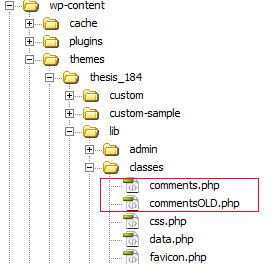 Rename the existing comments.php file in the classes folder to commentsOLD.php instead. 4. Upload the comments.php file that you downloaded and unzipped to the classes folder as a replacement for the original file that you renamed. Once you’ve done the above, your comments should now be displayed properly. So if you were having issues with your comments not showing up on Thesis 1.8.4+ after upgrading to WordPress 4, then this should work for you! I hope that helped, and please feel free to contact me if you need more assistance fixing your blog or website.